Rogers Pass is a mountain pass that rises 5,610 feet (1,710 m) above sea level and is located on the Continental Divide in the U.S. state of Montana. 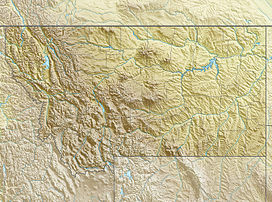 The pass is adjacent to Helena National Forest and is traversed by Montana Highway 200, providing the shortest route between the cities of Great Falls and Missoula, Montana. Rogers Pass is famous for measuring the lowest temperature ever recorded in the contiguous United States. The Pass experienced a temperature of −70 °F (−57 °C) on January 20, 1954. Only Alaska, Antarctica, Canada, Greenland and Russia have recorded lower temperatures. Rogers Pass is more than 100 miles (160 km) south of Marias Pass, and there are no other roads that cross the Continental Divide between these two passes. The region between the two passes is mostly wilderness, and the majority of it has been set aside and protected from future development. The Great Bear, Scapegoat and Bob Marshall Wildernesses have been consolidated into the Bob Marshall Wilderness Complex and permanently protect 1,535,352 acres (6,213.35 km2). The region is noted for its inaccessibility and as one of the last strongholds for the grizzly bear in the lower 48 states. The Scapegoat Wilderness is a 10 miles (16 km) hike north of Rogers Pass via the Continental Divide Trail. Rogers Pass in Montana was named by the Great Northern Railway for one of the line's locating surveyors, A.B. Rogers, who located the pass in 1887. Rogers has the distinction of having two passes named after him, this one in Montana and another Rogers Pass in British Columbia, Canada, c.373 miles to the north-west. In 1881 and 1882 A.B. Rogers was a surveyor for the Canadian Pacific Railway, and he located Rogers Pass in British Columbia, Canada, which was then used by the Canadian Pacific Railway (CPR) on its transcontinental line across Canada. The CPR named the pass after Rogers. James Jerome Hill, who controlled the Great Northern, then hired Rogers as a locating engineer on the latter, which built into Montana in 1887. Shortly after Rogers had located the pass in Montana that bears his name, his career ended when he was badly injured falling from his horse. Although Hill and the Great Northern eventually chose Marias Pass, 100 miles to the north, as the route over the Continental Divide for their transcontinental railroad, Hill saw to it that Rogers Pass in Montana was named after the surveyor. Rogers Pass is the location of the coldest temperature ever recorded in the United States outside of Alaska. On January 20, 1954, a low temperature of −70 °F (−57 °C) was recorded during a severe cold wave. The region is a noted location for observation of golden eagles and, to a lesser extent, bald eagles. In March and April, strong westerly winds help migrating flocks of eagles cross the Continental Divide so that they can spend the summer on the Great Plains. During these months, over 800 golden eagles and 129 bald eagles have been observed heading east. From mid-September through October, a similar migration occurs, but in the opposite direction. This is also a migration route used by other raptors such as northern goshawks, red-tailed hawks, and rough-legged hawks. Canada geese, tundra swans, and snow geese also use the pass during migration periods. The golden eagles and other birds can be observed from a distance as close as 100 to 500 feet (30 to 152 m). According to the Köppen Climate Classification system, Rogers Pass has a humid continental climate, abbreviated "Dfb" on climate maps. ^ "Rogers Pass, USGS Rogers Pass (MT) Topo Map" (Map). TopoQuest. Retrieved 2008-06-29. ^ "Bob Marshall Wilderness Complex". Flathead National Forest. U.S. Forest Service. Retrieved 2007-03-14. ^ Spritzer, Dan (1999). Roadside History of Montana. Missoula, MT: Mountain Press Publishing Co. pp. 432, at p. 264. ISBN 0-87842-395-8. ^ "Top Ten Montana Weather Events of the 20th Century". National Weather Service Unveils Montana's Top Ten Weather/Water/Climate Events of the 20th Century. National Weather Service. Retrieved 2007-03-09. ^ "Rocky Mountain Front Eagle Migration Area". NatureWatch Viewing Sites. U.S. Forest Service. Retrieved 2007-03-11. ^ "Weatherbase.com". Weatherbase. 2016. Retrieved July 27, 2016.